These vegetarian enchiladas are stuffed with eggplant, peppers, and summer squash. Make dinner prep quick by using prepared sauce and previously grilled vegetables. While it's baking you can toss a salad and a healthy dinner is done. It's all about balance. Last week I shared a recipe for Salsa Verde Pork Tacos. Today I'm going to swing over to the other end of the Foucault pendulum and share a vegetarian recipe for grilled vegetable enchiladas. If I were an organized, Type A, person I'd keep track of the meals our family actually eats [vs a meal plan which I may or may not keep up with . . . . squirrel!]. I would bet that our meals these days are close to 60-40 in favor of vegetarian meals. With a spouse who will only eat meat if it's from small, local farms, it's easier to prepare one or two large batches of meat-containing meals (soup/stew, casserole, or meatballs & spaghetti sauce) and let the kids eat leftovers when they aren't interested in the vegetarian option. I feel compelled to use the beginning of a new paragraph to point out that this meal is not finished on the grill. It starts on the grill to be sure, but one of my 5 tips & tricks for feeding my family from the farm share is to put up the abundance during the season. 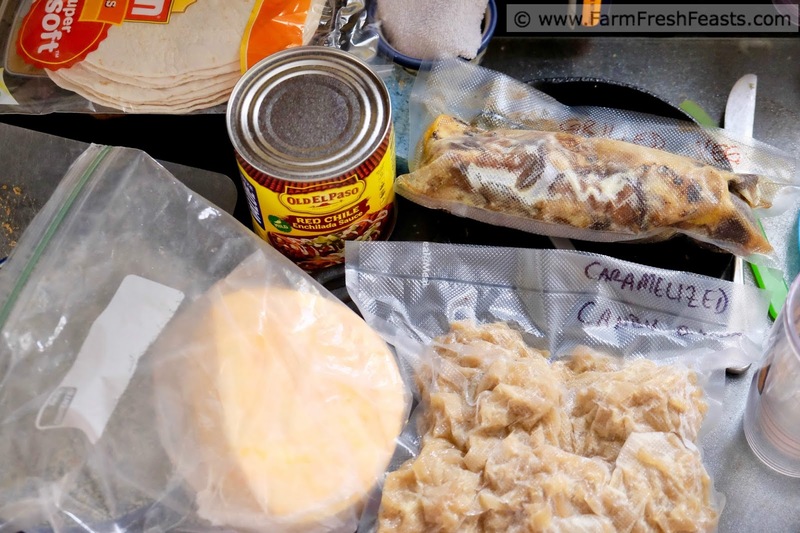 Grilling and freezing vegetables is one way I feed my family locally-grown foods year round, and if you've got the freezer space it's another tool in your kitchen repertoire. 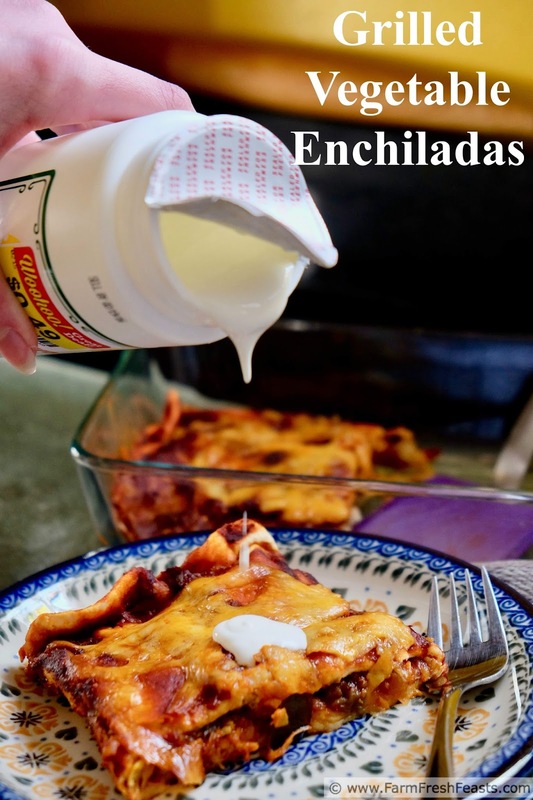 You know I couldn't let the run up to Cinco de Mayo go by without an enchilada recipe. 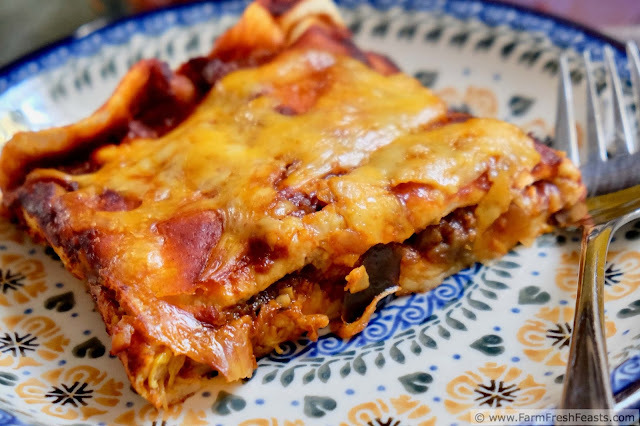 I first tried homemade enchiladas at a baby shower in Illinois when I was new to the Air Force, and that opened my eyes to the realization that enchiladas are NOT just for restaurants. 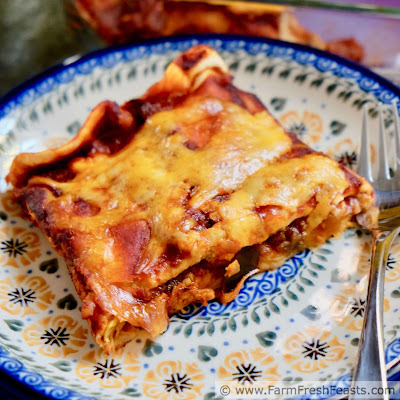 Once I got into making them, I realized that enchiladas are a terrific way to incorporate vegetables into my family's meals. I've got a Clickable Collage of Enchilada Recipes here. A couple of Notes--first, this recipe relies on previously grilled vegetables. When I fire up the grill, even though it's merely turning a couple of knobs and pushing a button as opposed to piling briquettes and lighter fluid and matches, I want to maximize my efforts. I will frequently grill multiple items for use in multiple meals. You should do this, too. Then it's a simple matter of assembling meals using previously grilled items. You can see this technique in my posts Grilled Steak and Vegetable Wild Rice Salad and Grilled Farm Share Vegetables--It's What's For Dinner. 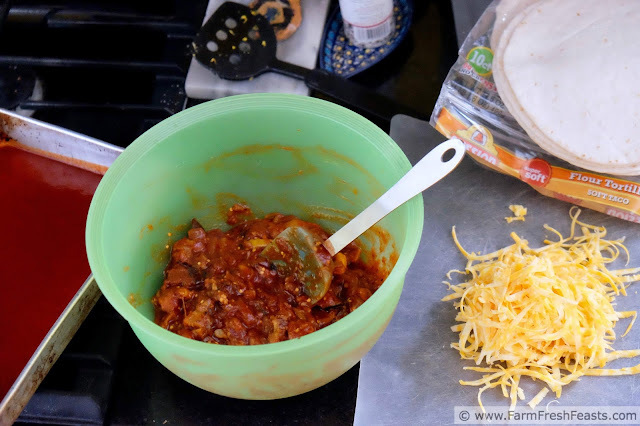 Second, I've kept this recipe simple by using prepared red enchilada sauce. To make your own red enchilada sauce using slow-roasted tomatoes, please check out my Confetti Turkey Enchiladas with Slow-Roasted Tomato Enchilada Sauce. For more recipes using eggplant, please see my Eggplant Recipes Collection. For more recipes using onions, caramelized or otherwise, please see my Onion Recipes Collection. For more recipes using peppers, please see my Pepper Recipes Collection. For more recipes using summer squash, please see my Summer Squash Recipes Collection. These collections are part of the Visual Recipe Index by Ingredient, a resource for folks like me eating from the farm share, the farmer's market, the garden, the neighbor's garden, and great deals on ugly produce at the grocery store. Preheat the oven to 350 degrees Fahrenheit. Pour ½ cup or so of enchilada sauce in a 7 x 11 inch rectangular pan (or whatever similar size you've got). In a large bowl, combine vegetables with ¾ cup of sauce. Place about ½ cup vegetable mixture and about ¼ cup cheese in the center of each tortilla, spreading to each edge so you have about a 2 inch stripe of filling across the tortilla. Roll up the tortilla and place it, seam side down, in the prepared pan. Repeat until you run out of filling (you will have cheese left over and may have tortillas, too). Pour the rest of the enchilada sauce over the tortillas. Top with the remaining cheese. Bake for 30 minutes until sauce is bubbly and cheese is melted, and any uncovered edges of tortilla are crispy and browned. Serve with rice and/or a salad, top with guacamole, and/or sour cream and/or salsa. I've had your enchiladas before. I'm a fan and I really like the idea of using grilled vegetables.